What really is in a handful of soil? I was talking with an elderly farmer today. He is now just shy of 80 years old and has not been to a doctor …ever and ran 1500 head of cattle and only got the vet out one or two times over his 50/60 years of farming. ( he now has reduced the farm area but still farms)What he had to say was nothing new yet so imbued with truth I simply have to share it. He said that the secret lies in the soil ( I have been banging on about this for years) ensuring that you have a rich microflora and earth worm count. Why? because the worms come up from the subsoils at night and clean up the upper surface foliage and soil of the toxins left by pathogenic fungi etc. ( Oh he never experienced facial eczema on his farm) They are like perfect little vacuum cleaners that take the pathogens and toxins below the surface. He also adopted the principle of a Sabbath year of rest for the land every 7 years. I just loved hearing what he has to say. Everything rung true and he had wisdom and knowledge far beyond that of any academic. Just go onto his farm and and there is proof. He said that the metabolic diseases we see today are simply the end result of incorrect farming practices, believing every salesman touting the latest and greatest grass strain, fertiliser etc etc….. He is vital and physically active putting many a younger man to shame. What a gem of a conversation. It will remain with me for ever. This refers to Soil Born Organisms. 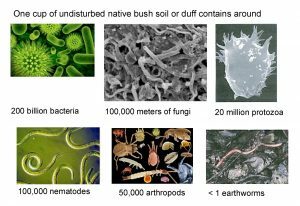 This is the soil microbiome, the unique mix of microbes in soil has a profound effect on which plants thrive and which ones die. Scoop up a handful of soil. 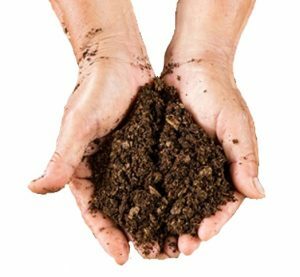 The dirt you hold in your palms forms the basis of the life around you, from the earthworms crawling in your garden and pasture to the biopsphere hundreds of meters in the air. But soil is not just a lifeless pile of earth. Symbiotic fungi living in plant roots—known as mycorrhiza ( along with a host of other microbiology (see picture below) —help the plants extract vital nutrients. Other microbes break down decaying plants and animals, replenishing the materials used by the plants. Now if this was functioning properly in our soils we would not have to feed our horses, pro and probiotics and the incidence of EMS laminitis etc would reduce dramatically. How can we make changes? Innoculating soils We can kick start the process of renewal by donor soil effects which help ecosystems recover. This last decade seems to have a far higher incidence of staggers, cancers, headshaking syndrome, strange neurological disorders, resistant strains of mudfever, viruses and EMS . These all caused directly or indirectly by pathogens. A pasture growing on a healthy soil will have the roots systems and the leaf surfaces covered with a mantle of beneficial micro-flora making it impossible for pathogens to get a foot hold. Bacteria, fungi, protozoa, nematodes, mycorrhizal fungi, flagellates, ciliates, amoeba, mites. Lastly, while not strictly micro biology but non-the-less very important, the earth worm. Elaine Ingham of Oregon State University suggested that in a spoonful of healthy agricultural soil you will find up to 60 million bacteria, 150-500 feet of fungal hyphae, 10,000 protozoa, 20-30 beneficial nematodes (not root feeders) and several thousand mites, springtails and other micro arthropods. She points out that in many heavily cropped soils many of these life forms have disappeared. The table below shows the variety of life in the soil – often called the “biomass”. It shows the number of organisms and mass in a typical 15cm of surface soil. How we can Increase the Microbiology of our Soils? By increasing the humus content of our soil. This may be done by broadcasting a thin layer of compost to the pasture. Applying a biologically active compost tea to the pasture. By growing a green manure crop formulated to encourage the correct ratios of fungi to bacteria. A blend of wheat, mustard (nature’s methyl bromide steriliser) blue lupin (nitrogen fixer) is good. By applying compost tea to the hay we feed out to our animals. This has the double effect of micro-biology being deposited elsewhere by the movement of livestock, ingested and excreted onto pasture. Aerating the subsoil will reduce compaction and thatching. This can be done mechanically with an aerator which injects a chemical oxygenator, compost tea, fulvic acid and humic acid some 600mm below the soil surface. Thermo-composting all collected horse manure, adding it to a bark chip pile and re-applying it to your pasture. By encouraging mowing contractors to drop clippings at your place and adding it to the bark, and manure pile. 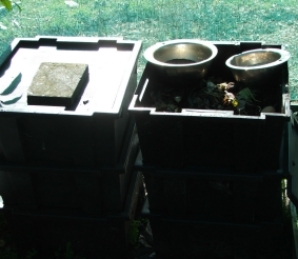 With imported material we recommend thermo-composting to get rid of any weed seeds and pathogens. By mulching all unwanted plant material, using a mechanical shredder and either composting them or using as a mulch. Don’t take them to your green waste transfer station, you pay to dump it, they make it into compost and sell it back to you! Why pay double for what is rightfully yours. By developing a worm farm and spraying the mineral rich liquid onto your pasture. See below for our simple process.The worms are fed household waste on a daily basis. Once a month I add a handful of kelp which supplies minerals in the correct proportion, a handful of Biophos and some bark chips which provide carbon compounds necessary for fungal growth. This rich brown liquid is collected in the bottom chamber and consists of solubilized minerals, humic acid and some microbiology. This can be diluted and watered onto nursery plants, fruit trees, vegetable gardens or sprayed onto your paddock. Nutrients are retained in the soil because they do not leach out or volatilize from the soil. Bacteria exude a slime that ‘glues’ nitrogen compounds to the surface. The microbiology cycles nutrients into the right form to the root system. Build soil structure so that oxygen, water and other nutrients can move deep into the soil which turn will increase root mass and depth. With the increased root mass, there is a reduced requirement for water as the plant will access it from deeper levels. Deeper rooting systems will improve animal health by reducing the need for mineral supplementation because, amongst others, minerals from the subsoil will be biologically available in the foliage. The roots exude ‘food’ for the microbiology. This in turn further increases the numbers of micro-organisms. The microbiology is able to stabilise soil pH reducing the need for excessive use of lime by actually holding onto the lime within the exudates of fungi and bacteria. Some organisms make plant-growth promoting hormones and chemicals. Micro-organisms are able to degrade toxic materials into safer compounds. Stallions coming from industrialised countries have poor rates of fertility due to agricultural and industrial toxins in their system. By tweaking the ratios of carbon to nitrogen in our compost and added organic matter we can create either a fungal or bacterial dominant soil environment. This in turn will make the soil favourable for either a clover rich pasture or one that sustains a range of plants suitable for horses. A healthy soil will help ‘pull’ horse parasites and eggs below the soil surface as part of the nutrient cycle. Modern agriculture has done much to destroy these beneficial organisms. The philosophy was to destroy specific pathogens with little regard for the collateral damage to the rest of the soil community. Rather like killing off the gut flora in our horse’s digestive tract when we feed it anti-biotics. Each time we apply herbicides and pesticides we wipe out beneficial bacteria, fungi, protozoa and nematodes. In short species diversity has been lost eg bacterial numbers have been reduced from several billion in the root zone to only a million per gram. By the excessive use of nitrogenous fertilisers. By the use of GLYPHOSATES . This acts rather like an anti-biotic on the land. Excessive use of some fertilisers which increase the salt index causing exosmosis. Anthelmintics that have gone through the horse’s digestive tract onto the pasture to kill beneficial nematodes, predatory mites to name a few. The routine use of copper sulphate and copper as part of horse management which when is excreted onto pasture will kill micro-biology. The use of heavy machinery to cultivate the land compacts the soil making it anaerobic. By keeping our pastures ‘clean’ without the diversity of plant life. Traditionally a ‘good’ pasture always consisted of clovers, perennial and annual grasses. Horses do far better on well selected ‘weeds’ An ideal pasture mix will be discussed in a later article. By mono cultural practices not only in plants and pasture but also animal species. Put simply compost tea is to pasture what yogurt is to our digestive tract. While compost is terrific stuff, compost tea is even better. In short compost tea is made by steeping compost in water, nutrients and oxygen. It’s used as either a foliar spray or a soil drench, depending on where your plant has problems. This can be made at home and recipes can be obtained off the web. The most important thing to note is that it must be well oxygenated through out the whole process otherwise you could be making a herbicide! The advantage of spraying this biologically active liquid on the leaves, that it helps suppress foliar diseases, increases the amount of nutrients available to the plant, and speeds the breakdown of toxins. Using compost tea has even been shown to increase the nutritional quality and improve the flavor of vegetables. Why don’t insects and diseases ‘like’ healthy plants? Put simply a healthy plant puts out chemicals that make them unattractive to them but even better compost tea will help kill off the pathogens. Bacteria: These like simple sugars, molasses, fruit juice, simple proteins, fish emulsion and soft green plant material. Fungi: Feed on complex sugars, amino acids, complex proteins like soy meal, cellulose, lignin, humic acids, wood paper cardboard. Nematodes: consume fungi, bacteria and each other. These are used to control grass grub and root weevils. Mycorrhizal fungi: These are very important for good pasture growth and need roots to germinate. The disease is caused by the ingestion of a toxin produced by a fungus (or endophyte) in perennial ryegrass. The highest concentrations of toxin are in the leaf sheath and seed head.The toxin has a specific damaging effect on the cells in the cerebellum of the brain that coordinate movement. Beneficial microbiology will out-compete the fungi responsible for producing the toxin and immobilise its effect. Is a bacterial infection caused by the pathogen actinomycete Dermatophilus congolens. Compost tea will help reduce its incidence and a horse grazing on a healthy pasture will have a good immune system.